Can we truly talk about God? Much of modern philosophy argues that how we see and understand the world if shaped first and foremost by language. Their point is that language is principal in how we talk of, express and question what we see, experience and imagine. Language is a living thing, directly impacted by culture. For example, it is often said that the Inuit (spoken by Eskimos) have dozens of words to refer to snow and ice. The language called Guugu Yimithirr (spoken in North Queensland, Australia) doesn’t have words like left and right or front and back. Its speakers always describe locations and directions using the Guugu Yimithirr words for north, south, east, and west. Our language directly shapes how we put into words what we experience in the world. Culture has a part in all this too. The notion of worldview refers to the framework of ideas and beliefs forming a global description through which an individual, group or culture watches and interprets the world and interacts with it. For example, we have no English word to designate the Japanese value of “Wabi-sabi” which means “Finding beauty within the imperfections of life and peacefully accepting the natural cycle of growth and decay.” As English Speakers we treat time as being broken up into objects that can be counted; such as five-minutes, three days, two weeks. I thus makes sense that we think of time as ‘stuff’ that can be saved, wasted, or lost. But the Hopi (a Native American language spoken in northeastern Arizona) think of time as a continuous cycle so that neither experience nor talk of time as an object to be measured. So can we talk about what truly is, if our language shapes what we see? Yes. We can talk of things for which we don’t have a specific word, such as wabi-sabi. So language doesn’t force us to see only what it gives us words for, but it can affect how we put things into groups to understand them. One of the jobs of a child learning language is to figure out which things are called by the same word. Our scripture today wrestles with these notions of knowledge, experience, language and worldview, Nicodemus seems to glimpse what Jesus is talking about, or that to which he testifies. But when Jesus puts it into words “be born from on high” he can only understand it as “be born again” as in a second time. It’s a double entendre, but one which only Jesus seems to understand in full. Nicodemus seems to see the world as divided, sky from surface, the heavens from the earth; whereas Jesus talks of God loving and entering the entire cosmos as a holy whole. As you listen to the story and dialogue what do you hear it talking of? How do you struggle to get it? 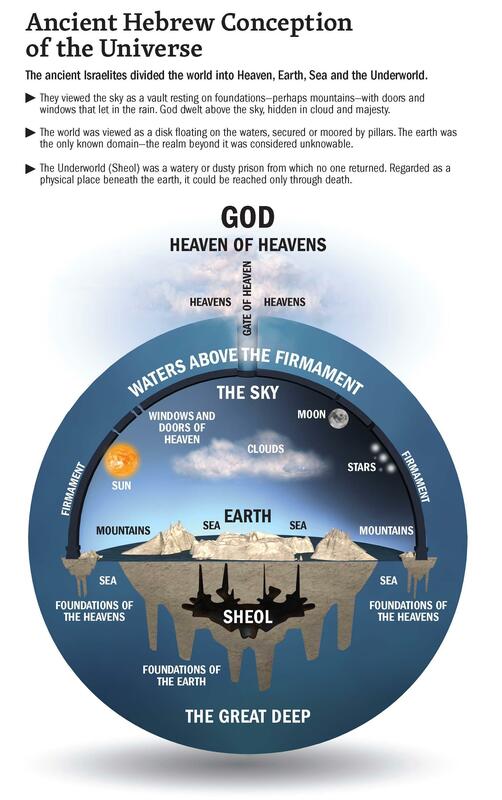 Take a look at the picture an description of ancient Cosmology (how the Israelites imagined the universe). How is it different than your own today? How does that possibly shape how we talk about God (the language we use)? ; or how we imagine God’s presence in, among and with us? Nicodemus risks his personal safety and status by coming at night to talk with Jesus to see more. What risk should you have taken that you didn’t? When has your sense of self-preservation trumped your sense of courage and wonder?